Wilton Icing Colors give you endless decorating possibilities when it comes to baking. The gel-based formula doesn’t change the consistency of your batter or frosting and gives you rich, true hues. To add color, dip a toothpick into the icing color and then into your batter or frosting. For a darker hue, grab another toothpick and repeat. Our wide array of colors let you craft the perfect shade for a themed party, holiday or season. Use them with buttercream frosting, royal icing, and even meringue. 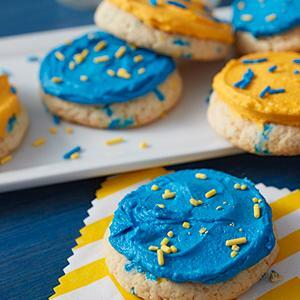 Confetti cookies dressed in team colors are a great way to get in the game. Just use Wilton Icing Colors to tint your frosting, spatula ice your cookies and add a few sprinkles in the opposite color. Sit back and watch them get tackled by halftime. 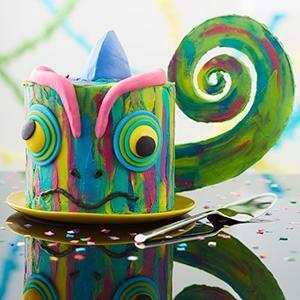 Kids will love this charming chameleon cake with lots of different colors, just like the real thing. The many shades of frosting were created using Wilton Icing Colors for a rainbow-like effect on the cake and tail. They were also used to color fondant for the eyes, nose, mouth, and horn. Perfect for a jungle-themed birthday adventure. 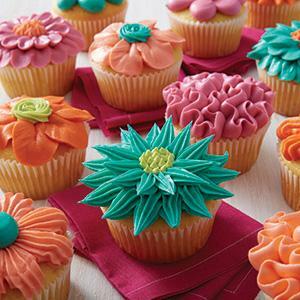 Make a garden of beautiful cupcakes with bright icing and a few of the most popular piping tips. Use Wilton Icing Colors to create vivid shades of frosting, then use decorating tips 104, 18 and 3 to pipe flower petals, rosettes, ruffles and center dots on your cupcakes. Then enjoy the sweet blooms!